Red-Leaf Barberry is a deciduous shrub reaching up to 5-6 feet tall and about 4-5 feet wide. The branches are slender, spiny, and small, and the leaves are roundly oval in a deep red to purple color. The small, yellow flowers appear beneath leaves from April to May. Bright red berries can be found along stems from late fall through winter. 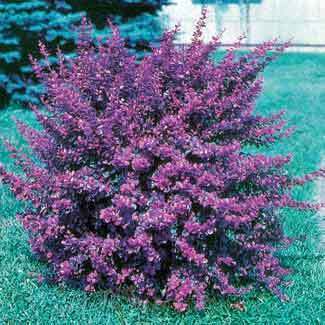 Barberry bushes grow in a vase like form, larger at the tip than at the base. The deep red leaves show up early in spring, making this shrub very attractive from early April thru November. The bright red berries last well into December. The shrubs transplant easily and are exceptionally tolerant of poor soil. They grow best in full sun, but will tolerate partial shade. They withstand drought well and do not like to be kept excessively wet. Hardy in zones 4-10. During the summer months these are shipped in a 2 1/14 inch pot 4-10 inches tall as well it all depends on the time of the year the item is ordered. During Fall and Spring months this item is shipped as a bare root seedling 6-12 inches tall.